Workman Publishing Company, 9780761161738, 440pp. Here are mental games, visual challenges, logic posers, riddles, and illusions, each designed to stretch neurons and give the brain a workout—all in a format that will fit in your pocket. The puzzles (both original and mind-boggling adaptations of classics) are rated in difficulty from level one to ten, but even the easiest are guaranteed to make the solver feel smart. Can you cross the Impossible Domino Bridge? Break through the Queen’s Standoff? Wield the Sickle of Archimedes? The Little Book of Big Brain Games: salted peanuts for the mind. 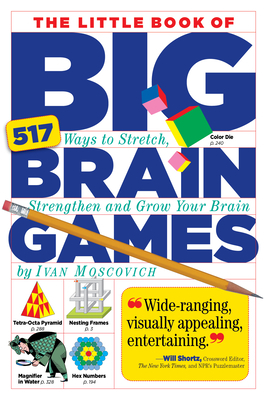 Ivan Moscovich is an internationally known and acclaimed inventor, puzzler, and artist. He has designed award-winning toys for Mattel, Kenner, Childcraft, Ravensburger, Binary Arts, and other companies, and is the author of the MindGames series and other books. Mr. Moscovich lives in the Netherlands.